This weekend I got to meet with hundreds of amazing people at the O’Reilly/Nature/Google event called Science Foo (short for Friends Of O’Reilly). The discussions in the conference rooms were fascinating, but the discussions one-on-one or in small groups during breaks were even better. 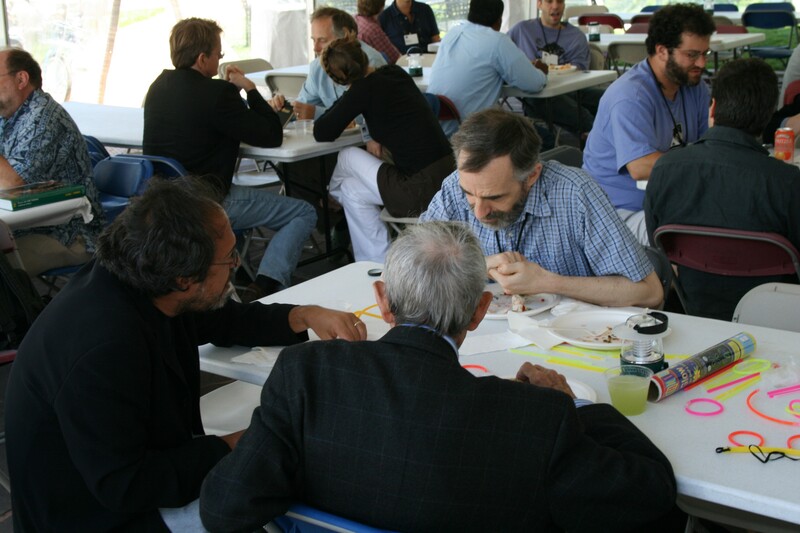 Some of the attendees I had met before, or even known well, such as Theo Gray, Chris Dibona, Sergey Brin, Peter Murray-Rust, Dean Kamen, Josh Bloch, Tim Hubbard, Vinod Khosla, and Larry Page, but most others were people I had only read, or read about. 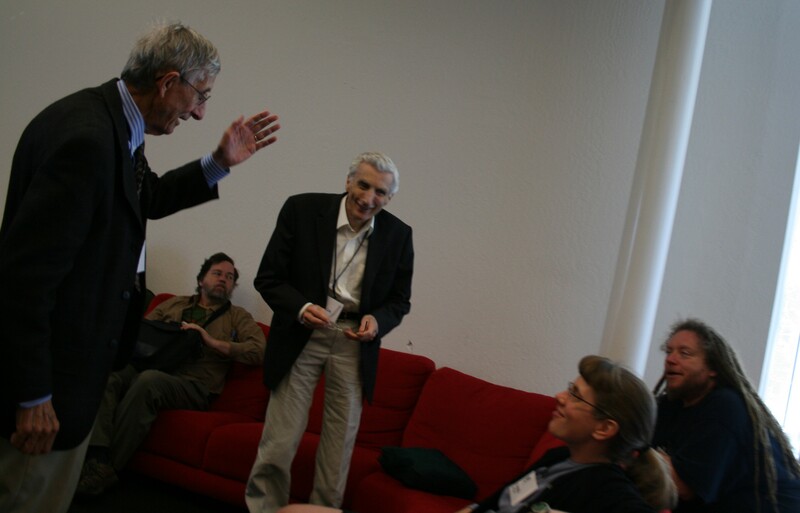 The photo above shows Freeman Dyson, Sir Martin Rees, and Jaron Lanier. More photos here. Steve Benner led or spoke at several marvelous discussions about synthetic biology and issues relating to recombinant DNA research and biohacking, along with Roger Brent (who had some interesting applications for the ultraviolet LEDs I was handing out). Henry Gee led a discussion on science fiction, attended by Kim Stanley Robinson, Neal Stephenson, and Greg Bear, during which we found that many of the scientists in the audience were also writers of science fiction. If you see people in the photos wearing light sticks from scitoys.com, that’s because I brought a few hundred of them and passed them around. People got very creative with them. Charles Simonyi talked about his recent tourist visit to the International Space Station, and Martha Stewart stood up during his talk to tell us about making meals for him to take up into space. And I finally got to thank Martha Stewart in person for getting my company off to a big start — a large order of my Film Can Cannons helped “start her company off with a bang” at the IPO party for MSLO, and was the first big order for scitoys.com. Eric Drexler, Lee Smolin and Freeman Dyson play with light sticks from scitoys.com.